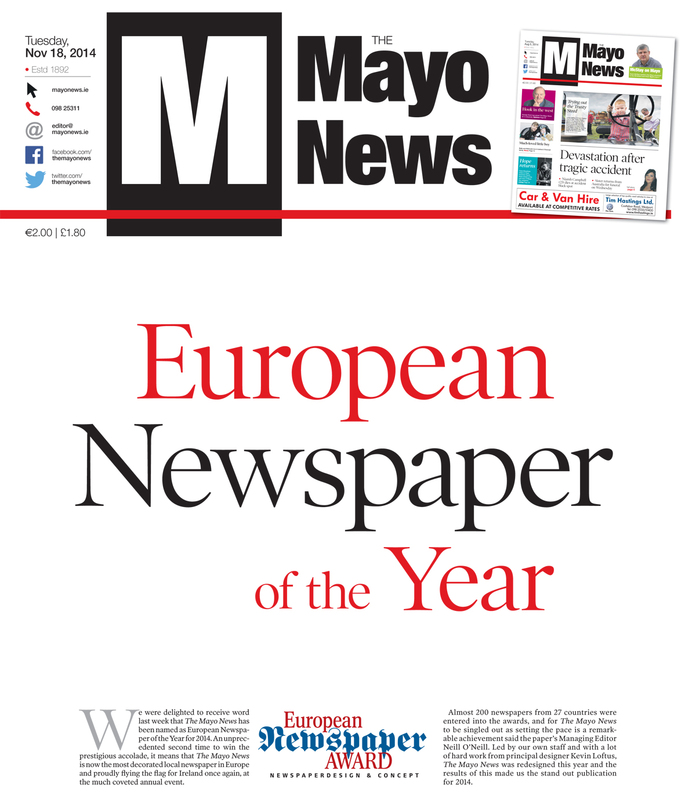 It was with great pride that we learnt last week that The Mayo News has been honoured as the best local newspaper in Europe for 2014. With almost 200 newspapers from 27 countries vying for the prestigious award, for an independent newspaper from the west of Ireland to be singled out is no small feat and one we are all justifiably proud of. It is hard to quantify the relevance and significance of this achievement, but suffice to say we will be the envy of our competitors and media colleagues today. Coming in a year that we redesigned The Mayo News, our first time to do so since 2004, the importance of every hard decision we took and all the debate over every small detail of each change now seems so worthwhile. We have always prided ourselves on being a step ahead of the rest and were never afraid to employ new concepts and ideas, and for that to be endorsed so prominently in winning this pan-European award for a second time, the only paper to ever have done so, is encouragement enough for us to continue with the same exacting standards week after week. Coming at a time when all our competitors have switched to a compact size and format, and redesigned, employing many of what had been our distinct features and ideas, we decided we had to once again raise the bar and bring something new to our thousands of loyal weekly readers. We now share this award with all our readers and advertisers, as officially the best local newspaper in the whole of Europe. Our peers across the continent have judged us and the independence and integrity of this award is something that we take comfort in, but also because it acknowledges what we do, through every stage of our production process. I cannot thank enough the team we have in The Mayo News, for their ambition, determination and drive, and every single one of our staff have contributed to this award, which is something I am particularly proud of. Our editorial and sales team create the concepts which our four man production team translate into the print you see before you every week, and while we do have our disagreements at times, we always end up with what we feel is the best outcome for our readers and advertisers. While every staff member contributed, I do have to single out our production team of Padraic Geraghty, Keith Reilly, Brian McHugh and in particular Kevin Loftus, for their visionary work in the areas of layout and design. We work under extreme pressure from week to week and for our standards to remain so intact and high, is the best possible endorsement of their ability and professionalism. Kevin, in particular, led our redesign, which took months and required many difficult decisions to be made, and I cannot praise him highly enough. This achievement belongs to him more so than anybody else, and that is something he will always have to his credit. It is a little known fact that we now produce two weekly papers in The Mayo News, and these are extremely busy times for all our staff. We remain the only independently owned and managed paper left in Mayo, and the only paper whose headquarters are in the county, and it is that autonomy that gives us the freedom to always be a step ahead. 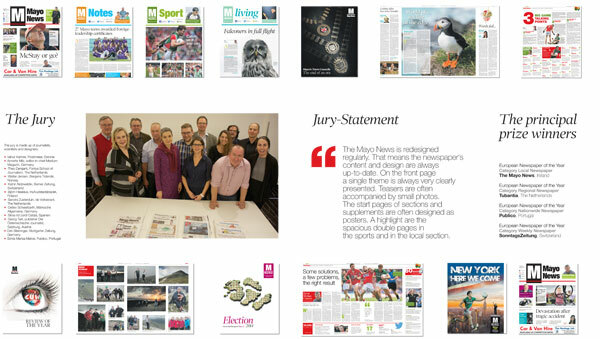 On behalf of all at The Mayo News I would like to thank you all for your loyalty and continued support for all we do. Rest assured that Europe’s best local newspaper, your local newspaper, has no intention of stopping at this achievement. We have the highest of standards to maintain and develop further.